Cat-man-do is one of our favorite restaurants. I've written about Cat-man-do before. 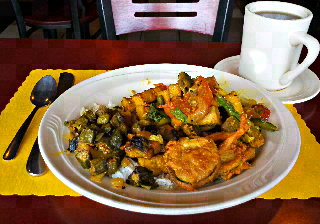 Today, we had the buffet: tofu veggie stir fry, veggie pakora, potato and okra, and basmati rice. All washed down with some delicious kalo chia, which is a spiced black tea from Nepal. Common Knowledge Bookstore and Tea House is an organic café located in Sandpoint, Idaho. The café specializes in vegetarian dishes. I enjoyed their food while I was on Day 5 of my Seven Weeks of Tastiness trip. For lunch, I ordered the Vegan Taco. While I was waiting for my food, a I noticed a couple other tables were also enjoying the same thing. The vegan taco has a brown rice tortilla at the base and then is covered with beans, brown rice, cabbage, carrots and sprouts. On top of all of that were scallions, avocado, and a very tasty seed-based cream sauce. The food took a few minutes to make since it was assembled from scratch. I enjoyed my soy chai and their free wi-fi while I waited. If you are in Sandpoint, I would recommend paying them a visit. The food was good and filling.